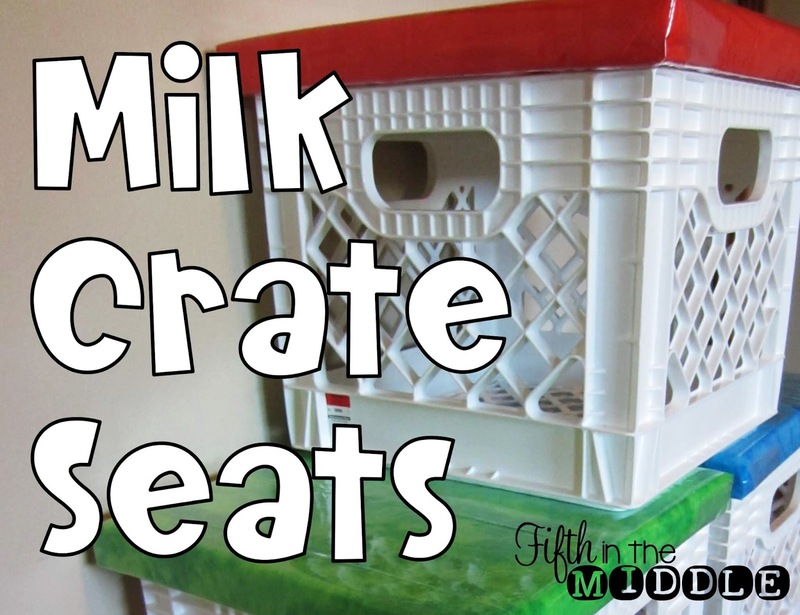 After much procrastination, I finally got around to making my milk crate seats for my classroom. I can't remember the countless places where I got my inspiration for my version, so please let me know if something sounds familiar. The main problem I had in getting these seats started was finding fabric I liked that went with my theme. I didn't want another pattern clashing with my other projects, but I really didn't want solid color either. Then somewhere along the way, I thought that a plastic tablecloth would be the way to go so I could wipe it off. But it had to be durable enough for fifth graders. So yeah, that was a challenge. Now, most places I've read suggest using spray glue to attach the foam to the board. Since I didn't have any, I didn't do that. And, if both things were 14"x14", why didn't they totally match up?! Anywho...Staple the edges of the fabric to the underside of the board. Cover with pieces of the shower curtain and staple again. Attach the 12"x12" particleboard squares to the underside of the seat. My dad screwed mine together for me. I will be keeping a clipboard (if it fits) and a mini pencil box with pencils and highlighters inside. I considered stapling a pencil pouch to the underside of the seat to hold small supplies, but the mini pencil boxes were cheaper. 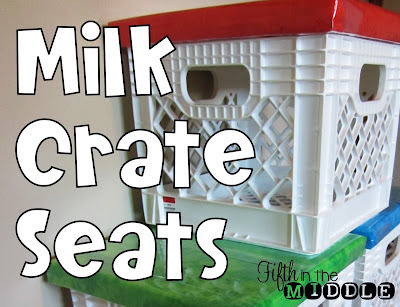 Love those crate seats....I see them all over Pinterest and blogs, but I'm too chicken to do them! They were a commitment. I hope they last! Those turned out really cute! I love all the different ways these are looking! So neat to see different styles. Great job on them! Your crate seats are fabulous. I need to make some....I'm just not sure I really want to tackle the project! So the question is... have they lasted this far into the year? I have an idea similar to this pinned for a to-do this summer. Is it worth the time/money? These are super cute. So they sit on top of the top of the crate??? I was a little unsure since the seat is bigger than the crate. I am going to get the container store ones too, they seem more sturdy. I made these last year with regular crates. Mine were not cut to fit in the grove and had to sit one top. I stored picture books that I was not using in them. Worked fine. I tried putting the velcro strips on the lip of the crate and on the bottom of the seat. It worked fine most of the year. The kids loved them. How did your seats hold up? Mine broke 1/2 way through the year. The wood literally snapped on a few! 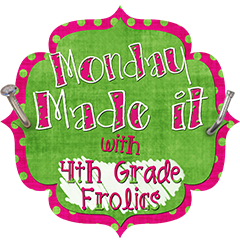 :( Of course it didn't help that some of my 4th graders were bigger than me! I am also curious how the plastic covers worked during the year, or if they were ripped up? I want to do this, but imagine the fabric getting ruined, and also thought a plastic cover would be perfect. Half of them have ripped plastic now (two years later). If I would have used a thicker shower liner, they would have held up better. That's my summer project! !